During the Second World War, the need for an on-board technical expert to join Bomber Command evolved. The various systems on the Handley Page Halifax, Short Stirling and Avro Lancaster witnessed the development of flight engineers. 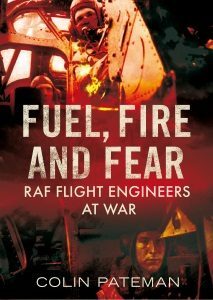 Fuel, Fire and Fear: RAF Flight Engineers at War explains the origin of engineers, the training of these men and the complexity of maintaining large aircraft in the air is an enthralling story. Many gallantry medals were won by flight engineers, including the Victoria Cross. Accounts of dangerous operational flying will be revealed by engineers in numerous aircraft, including those of Coastal Command. Direct entries into the RAF by civilians were undertaken to satisfy the demand for such technicians. Entrants underwent courses of varying lengths, but flying training time was sparse and remarkably it was not unknown for these men to qualify for their flying brevet without ever having flown in a bomber. This book examines true accounts that took place; many are based upon personal flying logbooks, and other unique material originating from the pilots and aircrews. This book is dedicated to the 4,357 flight engineers who lost their lives flying operations and to the 428 flight engineers lost in flying accidents during the Second World War. Lest we forget. For those brave men who gave their lives so we could live ours. Listen to Angus Wallace from WW2 Podcast interview Colin about his latest book, Fuel, Fire and Fear as they discuss the role of RAF flight engineers.